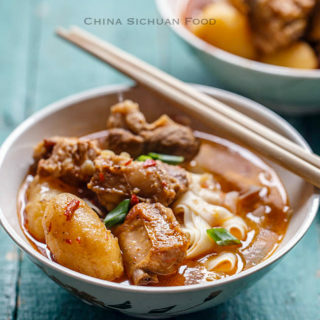 Sichuan style braised ribs with potatoes. Though noodles are staple food in northern China, Sichuan style noodles and Chongqing noodles enjoy a national popularity too. Different from the northern provinces, people pay more attention to make chewy handmade noodles. Then the noodles can be served with several stir-fries or salad. 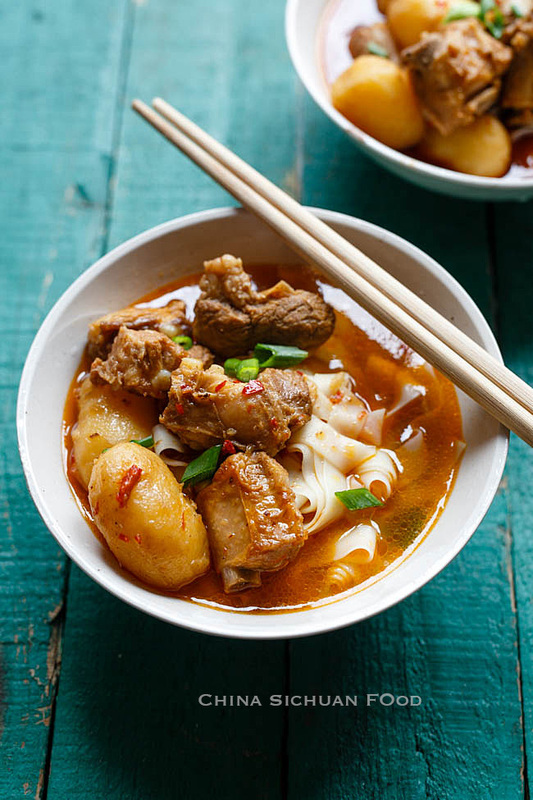 In Sichuan cuisine, we make lots of yummy noodles bowls with lot of seasonings and stews. 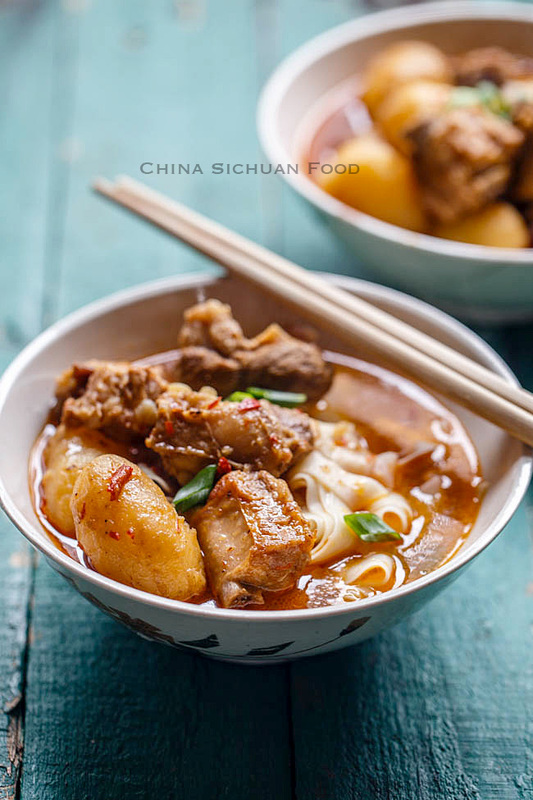 And here we are introducing one type of ribs noodles popular in Sichuan. You can use potatoes, taro and other vegetables as side dish. 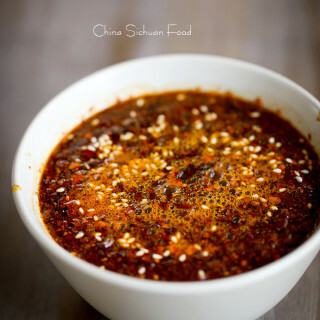 It requires very basic and common ingredients for Sichuan people. 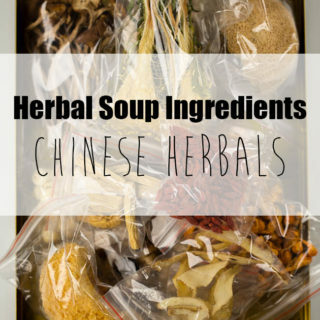 The most season is doubanjiang, douchi and several spices. 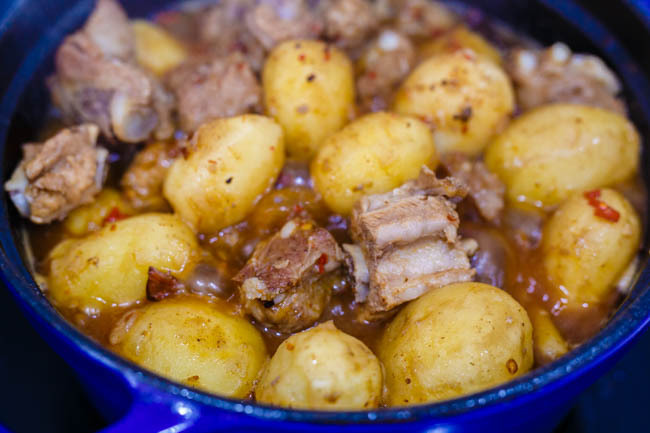 I use fresh small potato in this dish and they turn out so good. 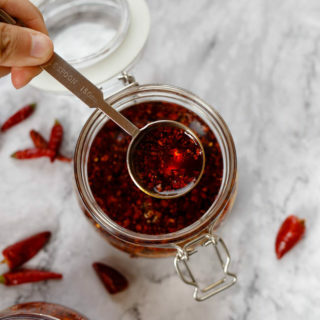 So if you get fresh peppers around, try with this at least once. 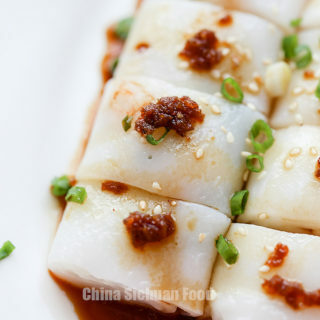 This dish is quite great with both noodles and steamed rice. When serving with noodles, keep around 1/3 of the juicy after thickening the sauce. 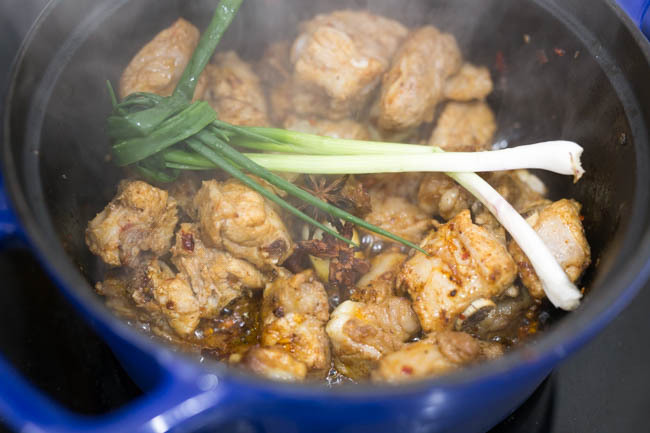 If you want to serve this with steamed rice, you can thicken the sauce for better flavored and stronger ribs. 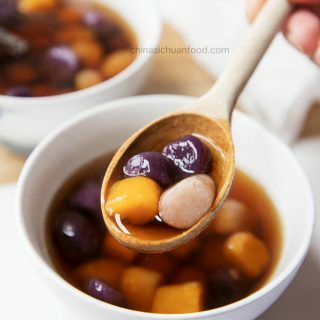 Besides, potatoes can be substituted with other seasonal vegetables for example white radish in winter, carrot and bamboo. 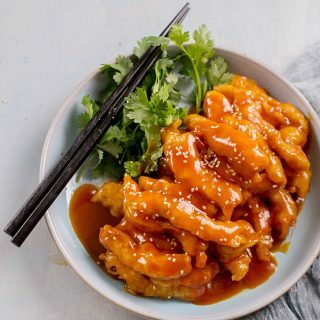 To bring this dish to the next level, you can serve it with homemade noodles or easy hand pulled noodles. Place the ribs in a deep pot with enough water to cover. Add scallion in. Bring to a boiling and then cook for 1-2 minutes. Transfer out and clean with warm water. Drain and set aside. 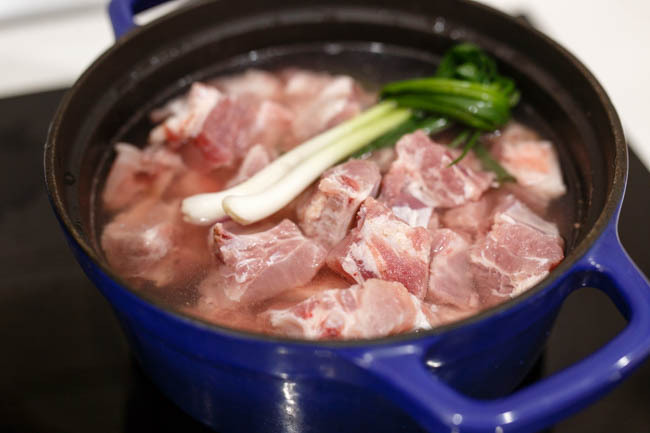 Prepare a clay pot or stew pot, add around 2 tablespoons of oil and fry doubanjiang over slow fire until the oil turns slightly red. 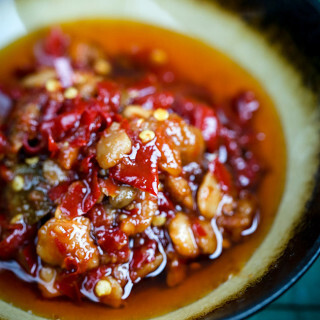 This is a very important step to remove the raw taste from doubanjiang. Add ginger, garlic and fermented black beans. Add the ribs in and let them stay for a while until slightly browned. 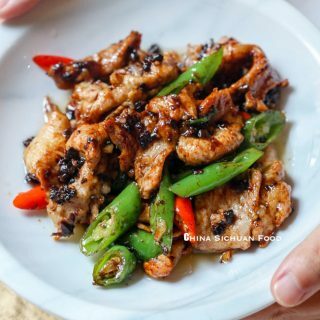 Add light soy sauce, cooking wine, sugar, star anise and scallion and fry for another 1-2 minutes. Pour enough warm water and add small potatoes in. 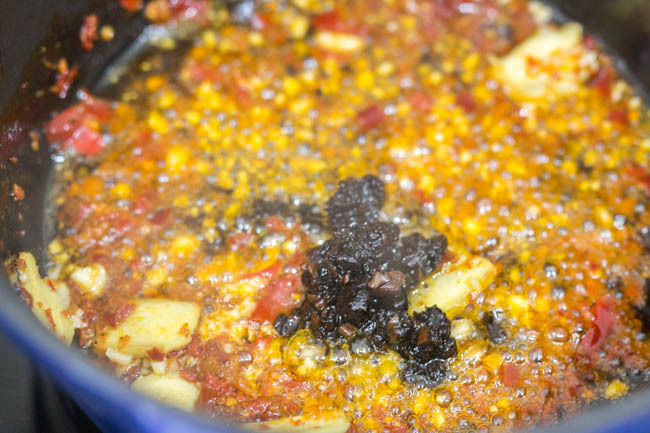 Cover the lid and simmer for 20 minutes until the potatoes are well softened. 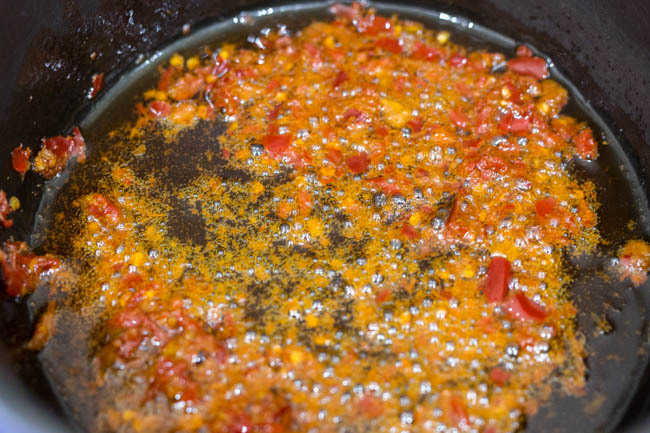 Uncover and continue cooking for 10 minutes until the sauce is reduced to 1/3 again. 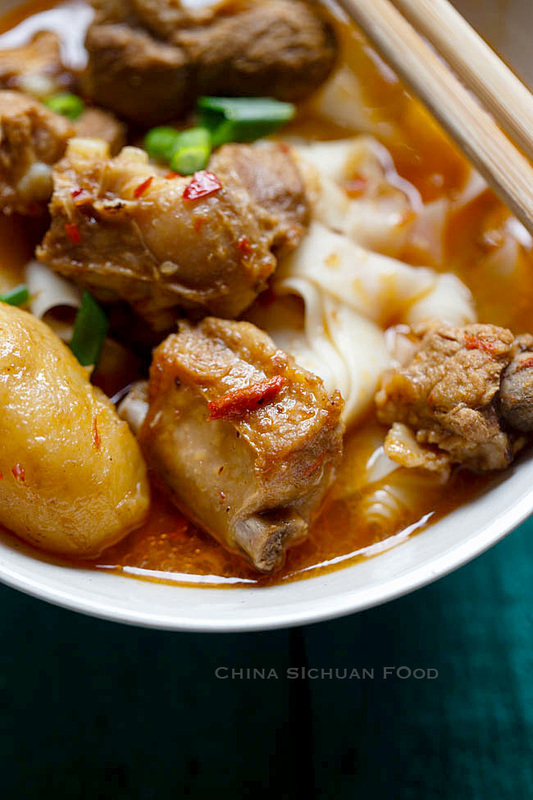 Cook noodles and serve with the braised ribs. Cook noodles according to the instructions. Add around 1/2 cup of water for cooking the noodles and a small pinch of salt and pepper in each serving bowl. Transfer the noodles in. Scoop braised ribs along with the juice. I’m going to make this tomorrow. 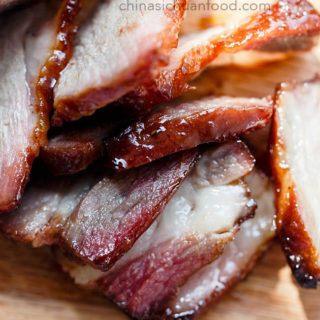 Maybe the recipie should read 800 grams pork ribs? this looks so tasty! I was wondering about the potatoes though. I don’t really know the correct English term for this, but they sell here so called “Spring Potatoes”. I found the translation “Young Potatoes” for them, but I don’t know if that’s an established name. They tend to be quite firm and are easily recognizable by their very thin skin. They’re also typically just the size of those in your picture. Did you use that kind for this dish or are those just regular potatoes and you picked out the small ones? In fact, both types can work fine with the dish. In Spring, I use freshly harvested potatoes because of personal preference. I could get some of the spring potatoes right now. I used those and it tasted excellent. With the firm potatoes the soup (without noodles of course) was also very good after reheating it the next day. I’d even say it was a little richer in flavor. I served it with some smashed cucumber salad as I felt it should be accompanied by some fresh greens. What do you use as side dishes for this? I usually serve this noodle soup as a meal with some salad or pickled or vegetables. You can blanch some vegetables and serve directly along with the noodle soup. Hi would you be able to cook this in the pressure cooker? If so, how long would you say to cook it? This is definitely can be cooked in a high pressure cooker. 20 minutes in high pressure cooker is enough.